It'll never be a true hot hatch, but the refreshed Honda CR-Z has been given a little extra power. 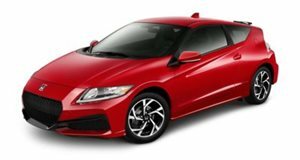 Despite losing the hard-edged performance attitude of the old and beloved Honda CRX that many were hoping for, the CR-Z has still managed to carve itself out a little niche as a more entertaining purpose-built hybrid than the Prius or Insight. Although we still wish Honda would drop a VTEC four-cylinder gasoline engine under the hood and ditch the hybrid powertrain entirely, the Japanese automaker has given the CR-Z a mid-life update that&apos;s making its debut at the Paris Motor Show. Along with styling changes front and rear, there are also updated 17-inch wheel designs, two new exterior colors and improved cabin storage space. But the most relevant improvement comes in the power department, the area in which the CR-Z has always been lacking. The 1.5-liter four-cylinder&apos;s variable valve timing system and ECU have been reworked, along with a few other technical adjustments to increase output from 112 horsepower to 119. Thanks to a switch from nickel-metal to a lithium-ion battery, the electric motor system has also been graced with a power surge, now up from 14 to 20 horsepower. All told, the CR-Z now delivers a combined output of 135 hp and 140 pound-feet of torque. As a result it is, as you might expect, a bit faster, but the CR-Z is still not a true hot hatch. A six-speed manual carries over - a unique feature among hybrids typically packing CVTs, and fuel economy has also improved. Updated pricing hasn&apos;t been announced, but the 2013 Honda CR-Z should be arriving in dealerships shortly.